I know I say this during every Milk Bar Monday post. But seriously, these are heaven. It’s my week to host this week so it probably comes as little surprise that I chose cookies. But not just any cookies: heavenly chocolate cookies. Tosi says these were created as an ode to the beloved fudgy brownie. We love brownies in our house – they are really one of Paul’s favorites – and he adored these cookies, even more than I can explain. I adored them too, not because they are perfectly salty. Not because they are rich chocolatey perfection. But because they represent the best part of the brownie: the chewy-almost-crispy edges. I could care less about the center of the brownie pan…I only want the edges. And these cookies have forever changed my brownie-loving life. 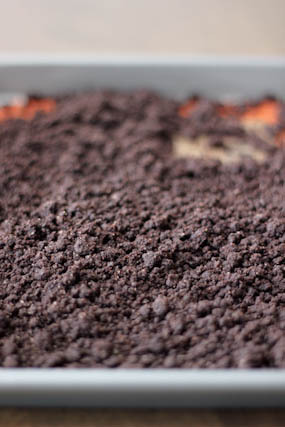 Oh, I guess I should also mention that the chocolate crumb in this recipe tastes exactly like brownie mix from the box. Remember when I told you to go ahead and double the recipe for the birthday cake crumble? Well, just go ahead and do the same here too. You’ll munch on it as a snack while you are baking. And you deserve it, so just go ahead and make some extra. I’ll say it again – this book is definitely my favorite baking cookbook. Inventive, fun, unique recipes that blow my mind every single time. 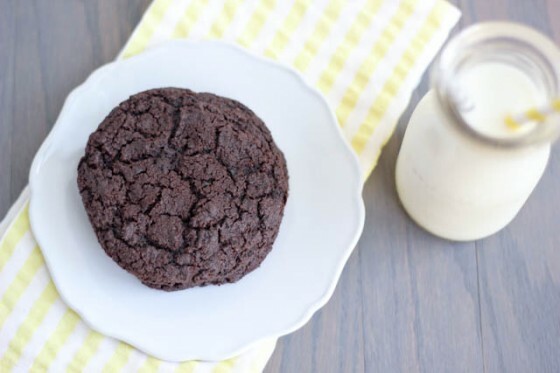 Momofuku Milk Bar's recipe for chocolate chocolate cookies. A dense, chewy, chocolatey cookie that nods to my favorite part of brownies: the edges! I baked my cookies for exactly 18 minutes and they came out perfectly but watch in the last few minutes so that you don’t overbake them. I followed the recipe exactly as written for these and we adored them. I wouldn’t change anything for the next time that I make them. These look fantastic Cassie! Tosi is certainly not afraid to use butter in her recipes. The extra chewy and less fudgy edges are my favorite part about the brownie too. They make an edge-only brownie pan with pan edges in the center of the pan, so each brownie has an edge! I need to look into buying one. These cookies came out perfectly, I know some of you girls have had trouble with past milk bar mondays’ recipes but not these… I think they look perfect. Great pick for this week Cassie! Let me know what you think about the creaming method…it definitely helps with all of the butter that her cookies have. I love her methods! They look great and love that you are so in love with them. That on your host week, you got a cookie that is just perfect for you, chewy edges and all. Yep, I am a fool for cookies!! These look fantastic! They look better then fantasic. So interesting that the recipe calls for bread flour! Luckily I have lots of that! 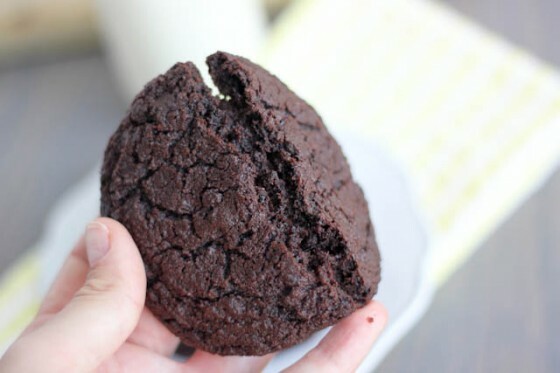 Brownie-like cookies is almost the best thing I have seen in a really long time! Christina Tosi recommends that bread flour be used in most of her recipes because the higher protein content helps to balance the high fat content (with all that butter!) I’ve started making all of my cookies with bread flour and I’ll never go back! Hokey Smokes! these look so good! Oooh – are there any leftovers? These look crazy good!!! LOVE that you picked these! Mine could have used the extra 2 Tbsp butter I swapped out as for some reason the gluten-free versions of these work perfectly with Tosi’s amount of fat (cookies, not the cakes though), but they were still incredible. I want to make them again and use them in the crust for a dairy-free ice cream pie! I froze mine and ate on on a long drive and it was perfection. Thanks for the pick! That is a great idea Jacqueline, I might try it out too. I just loved these! Ooh these cookies look PERFECT. Every time I see one of these posts, it makes me think that a) I really need this cookbook and b) I need to go and buy one of everything from the Milk Bar when I’m in NYC in the summer! You definitely need this cookbook, I think you’d like it! Oooh, these look scrumptious, Cassie! It would be quite the exercise to refrain myself from eating the dough and actually bake it! 🙂 Yum! Yes, it was very difficult!! No problem at all, life is busy! Just whenever you get to it. Great choice on this recipe Cassie! I just realized in reading your comments that I totally forgot to use Bread Flour in these! I wonder what would have happened if I had…they were still great but maybe that would solve my butter situation. Now I wonder if I’ve forgotten in the past? Anyway- your cookies look perfect with the original recipe. I think I’ll have to try this again! You know what, I actually thought about that after our email chain occurred. She recommends bread flour in most of her recipes and I have a lot of success using it! The edges of the brownie pan are my fave too! That means I must make these cookies!! You are too sweet! The yellow napkin is from Sur La Table; the straws from Lemon Drop Shop (http://www.etsy.com/shop/shoplemondrops) and the milk jug from an antique store down the street. Those places are gold mines! Those look amazing! That chocolate cookie needs to find its way to my plate STAT! Milkbar Mondays are awesome! Such a fun way to start the week! I definitely would’ve chosen cookies too – good call! These sound like perfection! Oh man, these look amazing! And that chocolate crumb? TO DIE FOR! I just need a cold glass of milk, please. Guess what I was thinking of just a second ago. Yes, Chocolate. Its time for some chocolate! What did you use for 1/4 cup of glucose in this recipe? Hi Jenny, I actually use glucose, it’s available at most craft and baking stores. If you don’t want to buy it, you can use 2 tablespoons of light corn syrup in place of the glucose called for. Let me know how they turn out! So, I spent half the day trying to find a chocolate chocolate cookie recipe that looked up-to-par, and came up with nothing! What luck to stop by here tonight to find a recipe with your glowing approval. Thank you, amazing lady! Funny! I hope you like this one, it is truly amazing. Thanks Ashley! I am so far behind the last couple weeks, so glad I didn’t miss these cookies! 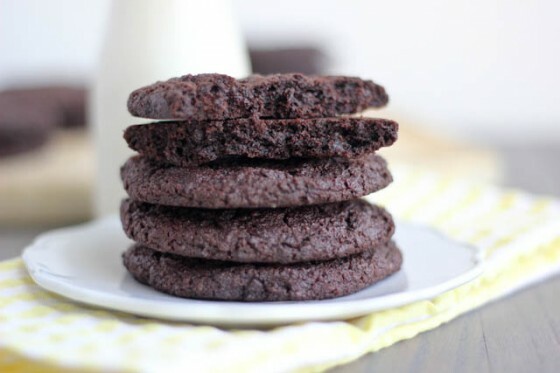 Brownies have to be my favorite dessert, so I am all over these cookies! You really–REALLY–make me want to buy this book! These look SO tasty! I’ve been on the fence about buying the Milk Bar book because I know some recipes can be time intensive but I think you just sold me on it! These cookies look great and the chocolate crumb sounds ammaazing. I went and bought the stuff for these and then realized I didn’t have glucose and had nowhere to buy it. Oh well. I’ll go look online. They sound amazing! I’m sure the texture is fantastic.